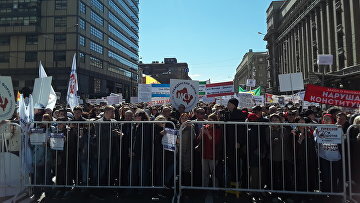 Russian President fixes fines for rally organization violations | Russian Legal Information Agency (RAPSI). MOSCOW, October 31 (RAPSI) – Russian President Vladimir Putin has signed a bill introducing fines of up to 100,000 rubles ($1,500) for abuse of right to hold rallies into law. The document has been published on the official website of legal information. Amendments would be issued to the Code of Administrative Offenses. The law envisages penalty for filing a notification of a public event with no intent to hold it, not meeting the requirement to notify authorities about refusal to hold a rally and failure to meet the deadline of filing such a notice. Under the document, these violations would result in fines from 5,000 to 20,000 rubles ($80 - 300) for individuals, from 10,000 to 30,000 rubles ($150 - 500) for officials and from 20,000 to 100,000 rubles ($300 - 1,500) for companies. According to the initiative’s authors, cases of abuse of right to hold rallies have become more frequent recently. Such occasions are often incendiary, they believe.